Philosophy for busy people. Listen to a succinct account of the philosophy of Kierkegaard in just one hour. Although Kierkegaard was not a philosopher in the academic sense, he produced what many people expect of philosophy. He didn't write about the world, he wrote about life - how we live and how we choose to live, particularly focussing on the individual and the notion of his (or her) existence. Kierkegaard was one of the founders of existentialism, regarding the 'existing being' as a purely subjective entity that lay beyond the reach of reason, logic, philosophical systems, theology and even 'the pretences of psychology', yet simultaneously remaining the source of all these subjects. 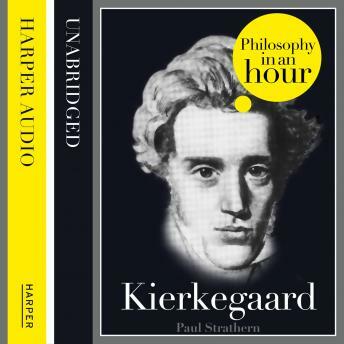 This audiobook is an expert account of Kierkegaard's life and philosophical ideas - entertainingly written and is above all easy listening. Also included are selections from Kierkegaard's work, suggested further reading, and chronologies that place Kierkegaard in the context of the broader scheme of philosophy.